I figured I'd do a monthly 'what I'm listening to' kind of thing. This could be viewed as a lame placeholder kind of post. And probably it is. But it's my blog! So there! 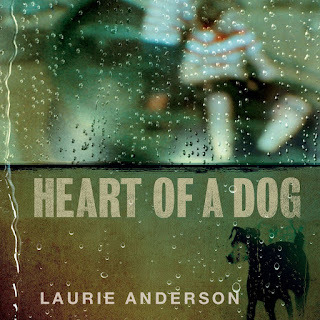 I'd been on the liberry's wait-list for Laurie Anderson's new "soundtrack", Heart of a Dog, for months (!! ), when I got the notification my ticket was called. It just happened to be a few days before we last had Mr. Pete. Anderson actually released her first film in 31 years with Heart of a Dog. It hits HBO in 2017, though maybe, just maybe, it will hit a (f)art house theaters before it gets to cable. The only places I've known that it has shown has been film festivals, though it's not even playing at the Cleveland International Film Festival. I don't know the entire ins and outs of the film, I know it centers around her rat terrier, Lolabelle, who at some point goes blind and then is taught to play a keyboard. I have a feeling the subject matter is more about how to deal with adversity in life, and it closes out with a song by Anderson's late husband, Lou Reed. Allegedly, the plan was never to have a "soundtrack" until they were mixing the audio for the film. If nothing else, at least that's a good story. Unlike her last film, Home of the Brave (one of my all time favourites), which incorporated monologues and song, this album is all talk. Sure, there is some interesting background music, but no singing. Anderson's diction and inflection, as always, are beyond perfection. She is intelligent, has good observations and insight. Laurie makes outlandish stories sound plausible. She's the consummate storyteller. I suppose (or I feel) I am losing some context listening to such tales without the visual context, as these narrations were lifted directly from the film. Oddly enough, I might think differently had I not known there was an accompanying film. The beauty of something like United States Live I-IV were Anderson takes you places with her stories. The same is true here, but deep down I know there is another component - one I have yet to see. I would not say Heart of a Dog is for the casual listen. It is a 70+ minute journey - and one for which you must be in the mood.